It's Rachel Maddow, rhymes with shadow. Not Maddow, rhymes with mad cow, which is how her name has been mispronounced by countless guests on Air America Radio's The Rachel Maddow Show, from Michael Moore to Viggo Mortensen. MSNBC hosts Nora O'Donnell and David Gregory (for whom Maddow has served as a regular panelist) have said her name wrong, as have most of her Air America co-workers, including her frequent co-host David Bender and the big-voiced announcer guy who introduces the show each day from 6 to 9 p.m. ET on Air America affiliates, the network's podcasts and satellite radio. (Maddow herself recently got it wrong too.) For years she has happily played a sound bite from Rush Limbaugh, with radio's top talker asking, in bombastic bafflement, "Has anyone ever heard of Rachel Madd-oww?" Well, in the early stages of Limbaugh's eminence, folks mangled his surname too. Not that Maddow is guaranteed to achieve Rush's power or notoriety  the 20 million weekly listeners, the zillion-dollar contract  but starting Sept. 8, she has at least a shot at correct-name recognition. That's when the 35-year-old assumes MSNBC's 9 p.m. hour, right after Keith Olbermann's popular Countdown. Radio's whip-smart, button-cute leftie (and utterly uncloseted lesbian) will have the sustained opportunity to sell her sophisticated views and perky personality to the political junkies of cable news. Her new job comes at a time when MSNBC could use a referee  or a nanny. As the network's ratings and billings have soared, so have tensions among the hosts  Olbermann, Joe Scarborough and Chris Matthews. The trouble spilled on-air at last week's Democratic National Convention (Olbermann to Scarborough: "Jesus, Joe, why don't you get a shovel? "), provoking one "high-ranking MSNBC journalist" to tell Politico.com's Michael Calderone, "The situation at our channel is about to blow up." Raised in Castro Valley, Calif., Rachel Anne Maddow took a bachelor's degree in public policy at Stanford, then won a Rhodes scholarship to Oxford, where she earned a doctorate in political science. Settling in western Massachusetts, she worked as an activist for prisoners with HIV and AIDS, and as a "yard boy." That's how she met Susan Mikula, an artist who has been her partner for the past eight years. On a dare, Maddow auditioned as an on-air personality for an Amherst radio station and got the job. She served as morning host on Northampton's WRSI for two years until the Air America start-up in March 2004. For a year she co-hosted the mid-morning Unfiltered, then filled the milkman's 5 to 6 a.m. slot, got promoted to a two-hour show starting at 7 a.m., and finally made it to dinnertime last year. 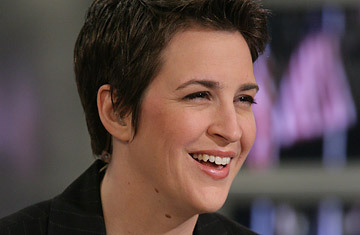 Maddow is the one AAR host who's had a continuous daily gig since the network began on March 31, 2004 (her 31st birthday). Air America originally hoped to lure audiences with brand names from other media: Saturday Night Live's Al Franken, rapper Chuck D., comedian-actress Janeane Garofalo. But radio talk is an acquired skill, and the two Air Americans best at it were both radio veterans: Randi Rhodes and Maddow. Rhodes, a hard-line humorist who mixed Michael-Savage-of-the-left analysis with Belle Barth earthiness, was AAR's top-rated host when she lost her job after making ultra-rude comments about Hillary Clinton at a San Francisco nightclub performance this March. The clear message: braying was out; and Maddow, the honeyed voice of reason, became the network's signature personality.